Sep 11, 2018; St. Petersburg, FL, USA; Cleveland Indians third baseman Josh Donaldson (27) detail view of his batting gloves in remembrance of 9/11 while at bat during the third inning against the Tampa Bay Rays at Tropicana Field. 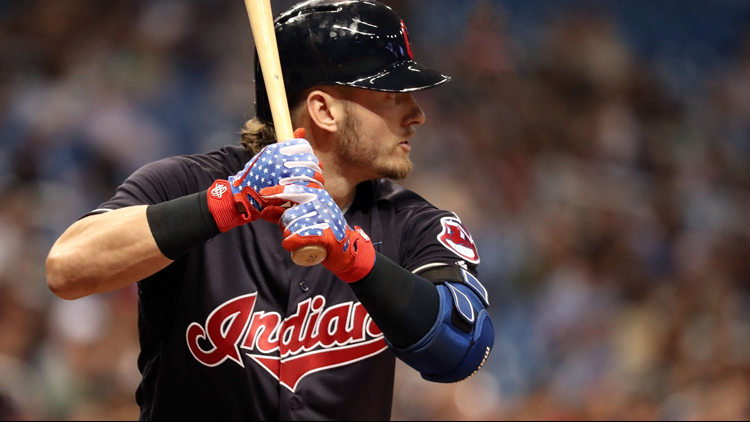 ST. PETERSBURG, Fla. (AP) - Josh Donaldson went hitless in his Cleveland debut, Edwin Encarnacion reached 30 homers for the seventh straight season and the Indians beat the Tampa Bay Rays 2-0 on Tuesday night. Rays: LHP Blake Snell (18-5) seeks to take over the big league lead in wins after going 5-7 last season. "It's amazing how much better he's gotten in one year," Indians manager Terry Francona said.